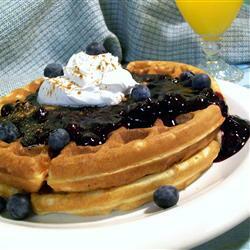 Allrecipes has an awesome, super-duper, easy, do-it-yourself blueberry sauce to use as a topping for pancakes, waffles, and more. Since my big sis gifted me a waffle maker for Christmas, I was able to make home made waffles and blueberry sauce for an after-church brunch today. This is really great to make in the summer when blueberries (or another fruit of choice) are at their best and often on sale!